Storey Elementary School student Sharleen Her was disappointed in her fourth-place finish last year at her campus' spelling bee -- not good enough to advance her to the district competition. She was determined to do better the next year. With the correct spelling of "malleable," Sharleen won it all at this year's Feb. 7 district spelling bee. She placed fourth out of 48 elementary students at the Fresno County Spell-Off March 15. 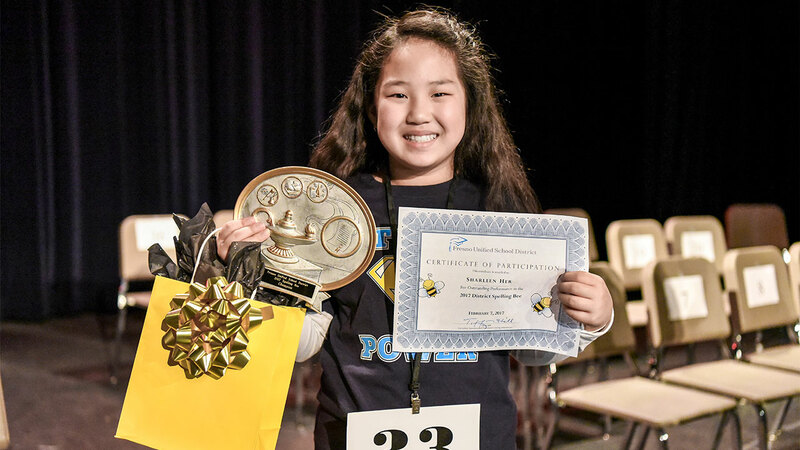 Sharleen, a fifth-grader, competed against 57 students in grades 4-6 from 19 elementary schools at the district event, held at Sunnyside High School's theater. She came into the event much better prepared. A year ago, Sharleen's parents, Ronald and Amy Her, were surprised at how competitive and intense the elementary spelling bee was. Seeing Sharleen's passion and dedication, they vowed to be more involved and encouraged her to continue. "We have your back if this is what you want to do," Ronald Her said. As promised, her parents provided guidance for study sessions. But they credit Sharleen's success to her love of reading and her drive and ability to focus and study on her own. To prepare for the Fresno County Spell-Off, Sharleen studied 20-30 minutes each day using her Merriam dictionary app to help with pronunciation and word origin. To help her remember tough words, she applied her own unique way of studying the word in detail. "I love to find something funny or weird to associate with the word and then I say it in my own way," Sharleen said. She also took to heart tips from her dad to help her on stage: slow down, think about the word, and spell it to yourself. Studying to be a spelling bee champ is not all that keeps Sharleen occupied. She enjoys cuddling with a good book every day. One of her favorites is "Auggie and Me," the story of Auggie Pullman, a boy born with extreme facial abnormalities who changes the lives and the perspectives of other students around him at a prep school. Sharleen loves how the chapters show the different perspectives of three characters -- Julian the bully; Christopher, Auggie's oldest friend; and Charlotte, his new classmate and friend. Sharleen likes all her teachers and participates in drama, choir, and cheer. "I love to sing and dance and I want to be a singer or actress, but I think my mom wants me to be a pharmacist," she said. Ronald and Amy Her are very proud of Sharleen's accomplishment and always encourage her to follow her passions.